The number of house fires per year remains high despite the use of more advanced home appliances and fire systems. The causes are many and different. The list includes dryer vent blockage and oil buildup in the kitchen exhaust. 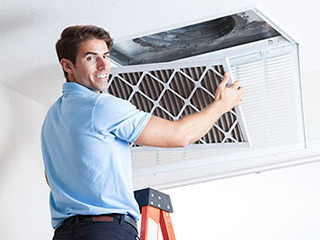 These issues can be effectively prevented with proper air duct cleaning. It can literally save you and your loved ones and your property as well. It's worth explaining the importance of dryer vent air system cleaning first. When the machine works, lint from the clothing builds up in the vent and causes a blockage. Since the hot air cannot be released properly, it puts the dryer at risk of overheating which can cause a fire. Lint is highly inflammable, which means if a fire does ignite it'll be able to spread very quickly. Statistics show that approximately one in every five house fires in the US is caused by a dryer vent blockage. With regular dryer duct cleaning, the risk of a dryer fire can be greatly reduced. Of course, timely dryer vent repair and replacement are essential as well, but professional cleaning can double, and potentially even triple, the lifespan of these components. You should keep in mind that removing the lint that gets accumulated all over the filter after every time you use the dryer is certainly not a sufficient measure of protection. This is because a good portion of the lint goes directly into the vent itself. A house fire can easily start from the kitchen exhaust. This is because oil, which obviously is highly inflammable, builds up against the exhaust hood's walls over time. It starts coating the filter as well. If a spark that's caused by the friction of the hot plate with a saucepan, or from any other activity in the kitchen, reaches the exhaust system's air duct, a fire will start almost instantly. This is sufficient reason for regular exhaust system cleaning. Frequent filter replacement is required as well. Professional dryer vent cleaning will reduce your risk of a house fire drastically while simultaneously keeping your indoor airflow fresh and clean. Contact our experts at Air Duct Cleaning Malibu today to have your home as fire-safe as it can be.